I found my old journal entry about our convoy along an agonizing road called the Meatgrinder. It was given this name because of the massive potholes that demanded an excruciatingly slow speed and the constant back and forth twisting of the vehicles’ steering wheels, causing the passengers to feel perpetually tenderized! I was pulling security in the back of the rear vehicle, a five ton dump truck, with two other soldiers. Our cover fire weapon was a big M249 Light Machine Gun, AKA Squad Automatic Weapon (SAW). The only action we encountered was a minor skirmish between myself and the SAW, and I ended up with a scar. 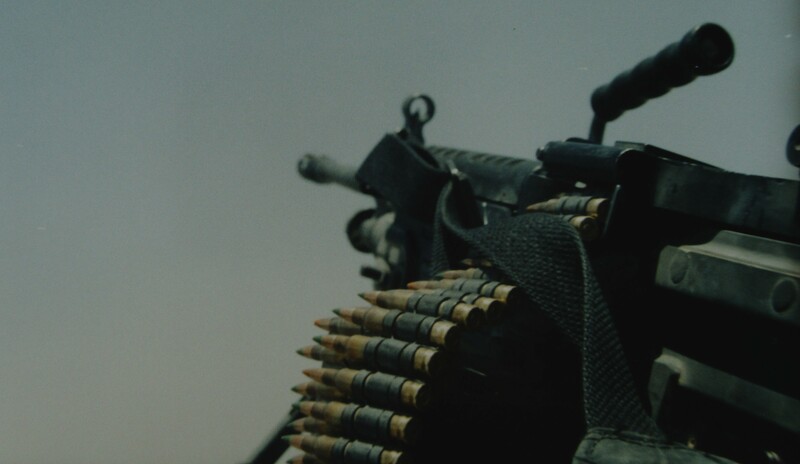 A close-up of the M249 SAW on my transportation vehicle. Ghosts loomed out of the dust, one moment just fractured shadows wavering in the distance, and in a blink of an eye, figures standing too close to the trucks, their gaunt faces murky and blotted with brown. How did they get so close so fast? I thought. Are we really moving this slowly? The dump truck bucked and lurched along the never ending dirt road, tossing me back and forth in the firing stand like a rag doll. Electricity hung poised in the air, and every time my hands came into contact with something metal (my pistol on my hip, the side of the truck, the drum of ammunition rounds for the SAW) hungry, unforgiving volts shot into my fingers with a distinct and greedy pop. The ghosts wanted — food, water, any items we would toss out to them — and they stood as close to the lumbering vehicles as possible, scaring the drivers who had orders not to stop for anything. How can they live in this dust? I wondered as I peered at them through my Army issue goggles that wouldn’t filter out the dust being stirred up by the huge convoy. The ghosts had no goggles or handkerchiefs to put over their mouths. 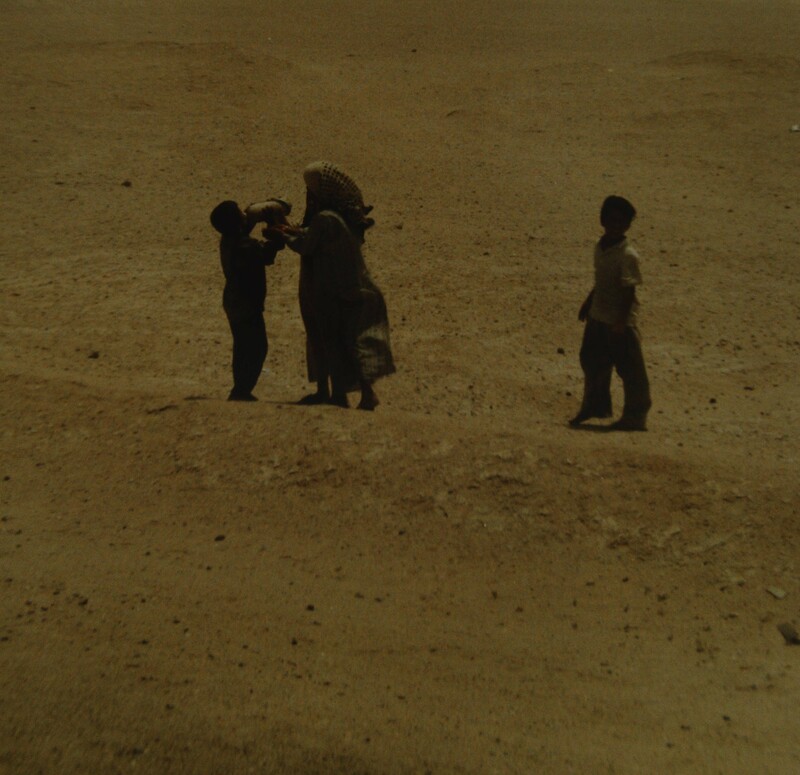 They seemed to come from up out of the earth itself, brown and dust-coated, parched and wispy. There were no buildings within sight, so they must have walked for miles to stand near the convoy and beg. Every so often there would appear a figure on a bicycle or donkey, one lucky fellow who had better transportation than his neighbors. One shepherd was spotted gathering a few scraggly sheep off a small patch of grass the same color as the dirt. It was amazing that he could find them; the sheep, grass, earth and sky seemed to blend together into a tan strata. But he found the sheep he wanted and loaded them into the back of his tiny truck, all the while paying no mind to the dozens of massive Army engineer trucks creeping down the Meatgrinder like great aching dinosaurs. Many of the people on the road waved at us, but most stood as still as stones, their thin clothing flapping in the wind. Only their eyes spoke, flashing greetings, challenges, questions. Nearly naked children were the most animated, jumping up and down, hoping for soldiers to toss out packets of candy. We weren’t supposed to give any of our food or water to the civilians, but many of us did anyway, especially if we saw children asking for water. Seeing the children reminded me of my son and I instinctively put a hand to my helmet where I had secured a small photo of him. Good, still there. A tight ball of pain curled small and hot, and then expanded in my chest. I tried to blink back tears, but only succeeded in creating a muddy trail down my cheeks. 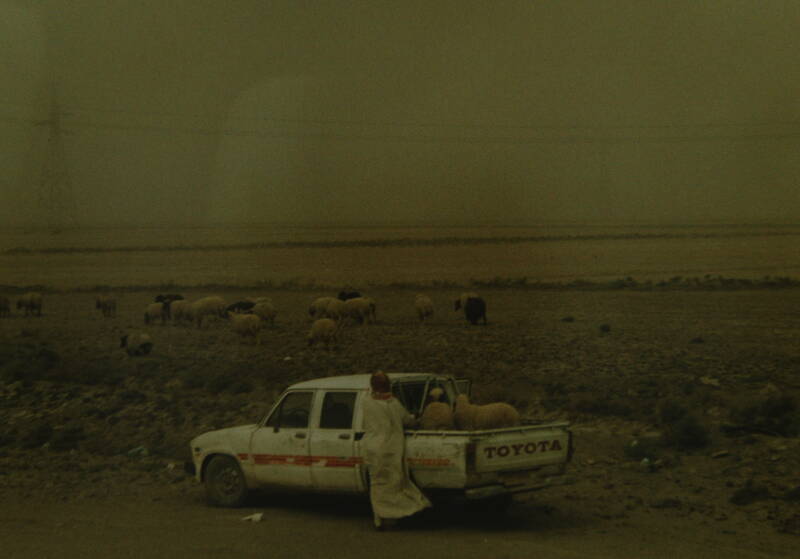 Me at the beginning of our convoy to Iraq. I hadn’t noticed that the sturdy bolt holding the SAW on its stabilizer had been vibrating loose from the constant bumps along the washboard road. Suddenly on a particularly steep bump, the SAW flew off its mooring and clattered onto the searing hot floor of the truck; the bolt lodged itself into a tight corner of the truck bed. Blubbering curse words and sniffling back tears, I retrieved the bolt, lifted the enormous rifle and heaved it back onto its stand, cringing as crackles of electricity bit devilishly into my hands. I had to untangle the twisted chain of rounds and re-fit the ammo drum, and now the road had become decidedly bumpier. The chain of ammo twisted and re-tangled with each jolt. I tried to hold the SAW in place, but the washboard road was now much bumpier than ever before, and the truck was bouncing me inches off the floor like a bizarre coin operated child’s ride. I could not reset the SAW on its mount with my hands alone. Using my torso to stabilize the rifle while frantically untangling the chain, I somehow juggled everything back into place in a matter of a few frantic minutes, all while being continuously micro-electrocuted. Finally the SAW was back in its stand, bolt retightened, and the drum was repositioned, ammo chain untwisted. Just as I heaved a sigh and relaxed, we hit one final giant bump and the SAW did the unexpected by flying straight up into the air and then back into my face where it cleanly split my cheek open while giving me a good electric shock. Blood and salty dirt trickled into my mouth. Oh damn, which pocket did I pack those Band Aids in? I wondered as I felt around in my cargo pockets while pinning the SAW down like a very cantankerous baby crocodile as once again we continued to inch down the Meatgrinder. 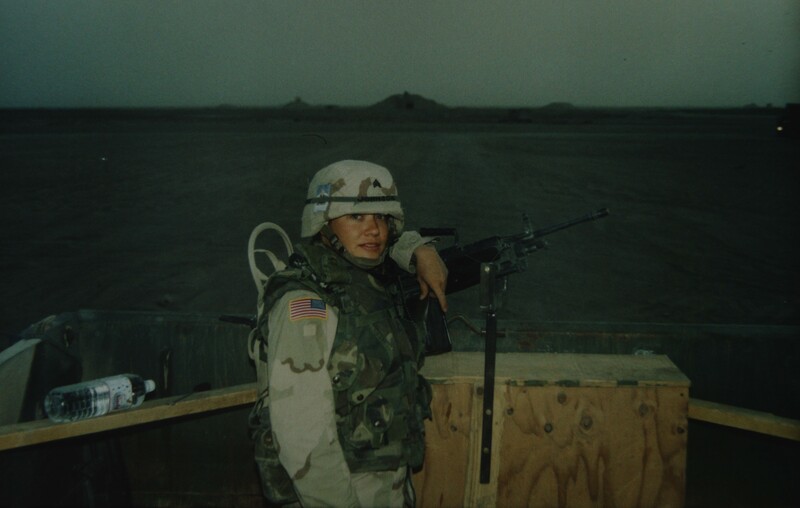 This entry was posted in Anecdotes, Deployment Retrospective and tagged Army Engineers in OIF, Convoy, Dump truck, M249 Light Machine Gun, National Guard convoys, OIF 1 convoys from Kuwait to Iraq, Squad automatic weapon, Vehicle on November 12, 2013 by Georgeann.